Booking a ferry to Elba is simple, easy and safe with AFerry, just use the booking form above to get a price. The most popular route is Piombino to Rio Marina. The average price this month for this route is £42 for a car and two people each way. Booking a ferry to or from Elba couldn't be easier with AFerry. You can either use the booking form at the top left of the page. Elba island has everything you can ask for on a perfect holiday, the sea, beautiful sandy beaches, the exotic countryside with chestnut woods and scores of archaeological treasures. Once you have taken your time exploring the exquisite natural landscapes and relaxed on the sunny beaches, you can take a walk back into the history of Elba, best known as the site of Napolean's exile. The island's history actually dates back to pre-Roman times; the evidence of which can be found in the island's archaeology museum in Portoferrario. Elba also offers fantastic nightlife coupled with excellent accommodation facilities and of course unbeatable weather, so why not book a ferry to Portoferrario now with AFerry and look forward to a fantastic holiday. 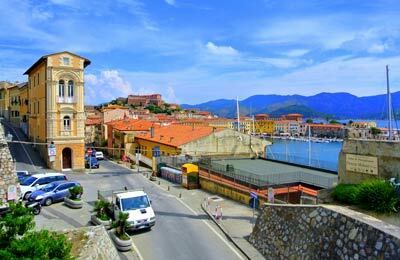 Elba is small island that prides itself on its surrounding waters. With activities such as fishing, scuba diving and surfing, you too can experience the beautiful turquoise waters Elba has to offer. 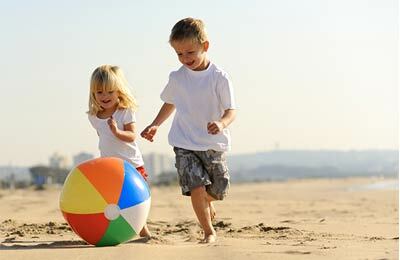 Alternatively you can spend your time inland relaxing on the beach, or hiking in the mountains. Known as the pearl of Tuscany, the island of Elba is located in between the Tyrrhenian Sea and the Ligurian Sea in the Tuscan archipelago. Within an area of just 200 square kilometres, Elba offers a varied terrain with stunning sandy or pebble stone beaches and contrasting turquoise waters, steep mountain cliffs offering breathtaking panoramic views and green slopes lined with chestnut woods. The dominating feature on the island is the granite mountain of Capanne (1018m), also known as the "roof of the Tuscan Archipelago" lies on the western side of Elba, whereas Mount Calamita, with deposits of iron lies on the east of the island. Between these two mountainous ranges lie the beautiful towns and sleepy little fishing villages of Elba with extraordinary wealth of historic and archaeological treasures. 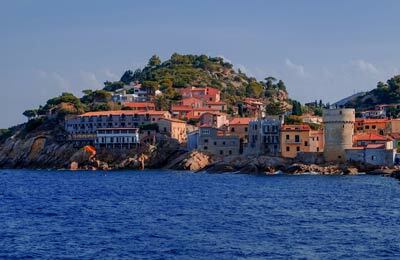 The island of Elba is served by the ferry company Moby Lines offering regular crossings to and from the island's port of Portoferraro to Piombino on the Italian mainland. The ferry crossing takes 1 hour on an average from Piombino to Portoferraio. You can book your ferry crossing simply and securely with AFerry and receive instant booking confirmation through email without any hassle of tickets etc. 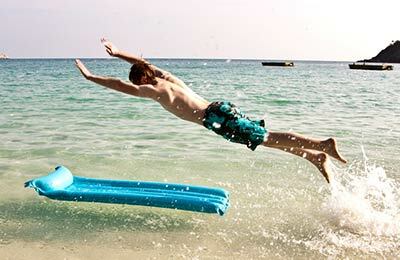 Besides sunbathing and relaxing on the island's many beautiful beaches, you can also indulge in some activities such as surfing, scuba diving, snorkelling and boating. If you are more of an adventurous type, the hour hike up the highest mountain peak in Elba, Mount Capanne is for you; the spectacular views of the surrounding islands of Corsica, Capraia, Pianosa and Monte Cristo from the top of the peak will make you forget all the effort you've put into the hike and recuperate your energy levels immediately. The archaeological museum of Portoferraio, Palazzina dei Mulini (the residence of Napoleon and his sister during exile) and Villa of San Martino (another one of Napoleon's residence on Elba) and ancient pre Roman castles are just a few to mention. Elba also offers excellent night life with plenty of bars and restaurants at your disposal, all in all making it a unique magical island. Very efficient with frequent crossings. Port can get very busy during August so leave yourself plenty of time, although, should you miss your ferry, Moby will book you on next available.